Every generation has its moment. That moment that you remember what you were doing, what you were feeling, and where you were when your world was forever changed. Pearl Harbor, JFK’s assassination, and for younger adults; September 11th, 2001. It is a day that is synonymous with hatred, unabashed loyalty, revenge, and destruction. It is a day that will live in infamy forever and proved to the greatest Nation on earth that we are not above being attacked. The hate that spewed forth towards us was brought to our footsteps. And we didn’t know what to do. We as citizens were powerless to do anything. We didn’t know whom to trust, whom to blame, or what to do next. We slowly did what America does best and that is recoup, rediscover ourselves, and rebuild. There was a great component that we were missing though; we needed a voice. Not a politician, not another puppet on a string to tell us what to believe in or whom to hate. We needed a common man. One that could take our words and turn them into anthems to reinvigorate us. One that could live through us to describe our pain. One that could settle our fragile nerves and truly let us know that we will be alright. Someone to lead us and let us know that we will live to fight another day and put back all the pieces together that had been shattered right before our eyes. We were searching for that man, much like Gotham always turned to Batman. We needed him, begged for him, and he didn’t let us down. That man was Bruce Springsteen. Bruce Springsteen released The Rising in July 2002. He is, of course, a Jersey guy with deep ties to the New York area. Being a great wordsmith and having an innate ability to tap into people’s thoughts and feelings, he was able to unleash a 15 song diatribe to live out the experiences that so many citizens went through. From the opening “Lonesome Day” that puts a smile on being able to hold onto nothing but our own private lonesome day to “Into The Fire” with the opening lines of The sky was falling, into the street with blood, it was clear this was not a regular album release. It was a declaration of strength and perseverance spoken for the people that braved these horrible actions. The songs lend themselves to people who didn’t feel as though they had a voice and were faceless. Bruce put a face to their fears and concerns and put it out there for the world to see. “Mary’s Place” finds the world settled, if only for a second. A place for neighbors to get together to put the outside world behind them and feel as though life will get back to some place of normalcy, at some point. And finally, “The Rising”. The ultimate anthem for New Yorkers to rally around. Bruce is telling his friends, his neighbors, and strangers to come together. Though the biggest black eye in America’s history happened on our watch, we will show the world why we are the greatest force to be reckoned with and though we are down, we are not out. We will come together stronger than ever and fight as one. We will all be part of America’s next Rising! 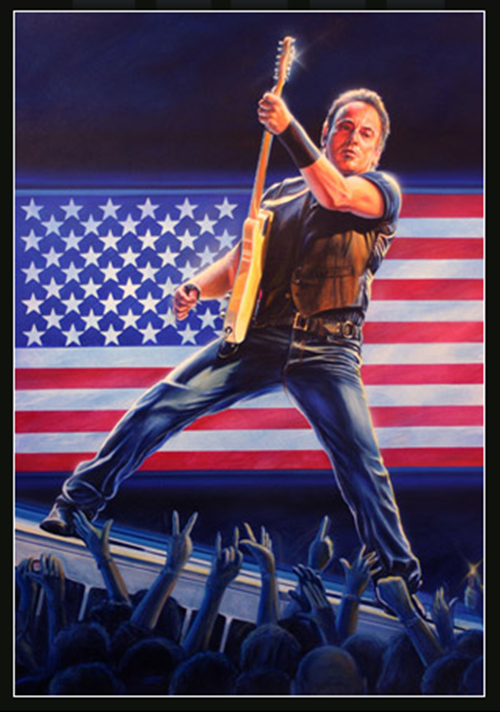 Somehow Bruce Springsteen was able to channel every single thought, hope, and prayer of America and pin it to words. They were songs expressing our hopes and fears moving forward knowing our lives would never be the same. He put to rest our minds and left us feeling that we will be put back together again. Not in the same fashion so as to remember what happened. His expressions and monikers guided us to relevance again after being blindsided. He gave us our voice that we so desperately needed. A way to remember that we are not invincible and the actions of others can cripple us. But they will not tear us down. They will not tear us apart. They will only make this divided Nation whole again and remind us we are all brothers under the same sun. We are proud. We are whole again. We are Americans!